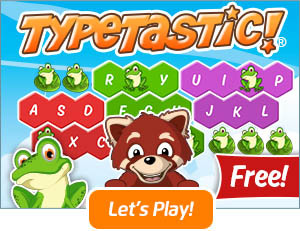 I was introduced to touch-typing at a young age and have worked to improve my skills ever since. 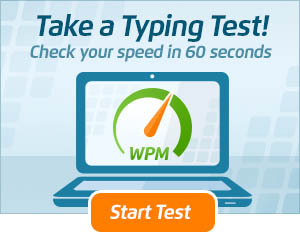 90 words per minute is a standard rate for my everyday typing—but I can type at 110 words per minute if I’m intensely focused, and my record here on TypingTest.com is 136 words per minute. As a professional writer, having a fast type speed is pretty important for me. I create roughly 12,000 words of new content each week, and that doesn’t even include emails, status updates, instant messaging, forums posts—and, well, you get the idea. When all my writing is tallied in, my weekly total is closer to 20,000 words. We all type a great deal—whether it’s for work emails or Facebook chats or forum posts. My experience can give you some insights on how learning touch-typing can enhance your everyday experiences. Here are seven specific ways touch-typing has made my life more awesome. 1. I save 8 hours each week. That 20,000 words of mine means I spend 222 minutes of my week just typing, and that’s with an average type speed of 90 words per minute. If I wrote at the same speed as the average person (28 words per minute), I would be spending 714 minutes each week instead. I save more than 8 hours each week just by typing more quickly. Think the same wouldn’t apply to you? Researchers recently found that the average corporate employee spends 2.5 hours each day answering emails, and that doesn’t even include the personal ones. Sure, not all of the time spent on email is spent typing—but let’s say that, everything added in, you spend 10 hours of each week actively using a keyboard. If you currently type as quickly as the average person (28 words per minute), increasing your type speed to 60 words per minute would save you more than 5 hours per week. That frees up more than 8 days over the course of a single year. 2. Touch-typing makes me money. There are two ways touch-typing has increased my earnings. First, as a freelancer, I’ve been able to pump out loads of content in a short amount of time when I needed extra cash. It’s not my favorite sort of work and it can get pretty stressful, but I’ve had $2,000 weeks thanks to the sheer volume of content I’m capable of producing. Second, and more applicable for non-freelancers, is how impressive it is to type more quickly. Even if you’re not more intelligent or eloquent than the average employee, having a high type speed gives the impression that you’re a better candidate. This opens the doors to greater recognition, job opportunities, and promotions. 3. I can capture more of my thoughts. Do you type as quickly as you think? Well, that’s fine: Neither do I. However, the more slowly you type the more your ideas will be forgotten. True, this gives you the chance to be careful about what you say, but while a thorough recording of one’s ideas can always be trimmed down, forgotten ideas are generally lost forever. Touch-typing allows you to get into a flow state from both a physical and mental perspective: If you’re always worried about hanging on to the last idea, you can’t fall into a productive rhythm of thought and the entire process becomes more stressful. 4. It allows me to travel the world. Part of my career is travel blogging. Beyond the fact that freelancing is a huge chunk of how I fund my adventures, I’m able to record my experiences more fully when I can type quickly. (Those curious can check out my website, linked below, for immersive travel narratives.) There have been several occasions where I was at an event or on a bus and needed to capture, in words, what the experience felt like. I couldn’t have done it if my eyes were glued to the laptop. Plus, the fact that my eyes wander while I’m typing has helped me make new connections with people around the world. I don’t have to tell people I’m a writer: They can tell just by how comfortable I am with my laptop. 5. It makes me a better writer. There’s a difference between “writing” and “typing.” “Typing” is just the way to get the words down, while “writing” is a complex mental process that taps into the most advanced parts of your brain. If you have to think about typing—checking where your fingers are, remembering where the letters are placed, etc., etc., etc.—you are using part of your frontal cortex for those tasks. By freeing up those parts of your brain for focusing on the process of writing, you can enjoy the process more and complete it more effectively. In short, you become a smarter writer when you naturalize the process of typing. 6. I can socialize better online. I’m not saying I only socialize online, but when I go to email or instant messenger I have the opportunity to express myself more fully and rapidly than I would otherwise be able to. Since I can say what I mean to quickly, I’m able to more effectively multi-task while chatting; as I wait for friends to respond, I can check out YouTube videos, look at funny cat pictures, or (maybe, just maybe) get some work done. I’m also able to get involved in forums, comment on blogs, and otherwise enrich my online life. Even online gaming is improved. Especially as someone who travels the world, the digital-social experience is an important part of how I connect with people—and I wouldn’t be able to do so nearly as effectively if I couldn’t type quickly. 7. I’m a healthier person—physically and mentally. Writers, much like the majority of the population these days, live a sedentary lifestyle. There are plenty of risks that arise from that, including repetitive motion injuries, weight gain from inactivity, and more. By reducing the amount of time I’m obligated to spend at the keyboard, I give myself a greater opportunity to be active. The proper techniques have allowed me to avoid injury despite the immense amount of time I spend typing. And, as I mentioned when discussing travel, I feel more comfortable taking my writing away from my desk. But there’s also a different element of health that touch-typing has opened up for me: Greater mental health. As a person who struggles with depression and anxiety, typing out my thoughts and feelings has become a major way in which I process my internal struggles. By putting my troublesome emotions into words, I bring them to a place where they can be observed, understood, and dealt with. While not everyone will see identical benefits from improving their type speed, my life has improved in these seven ways and many more. Have your own experiences about the benefits of typing that you’d like to share? Leave your thoughts in the comments, below. 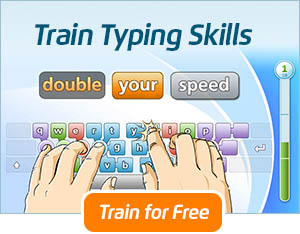 ← Are Typing Skills Really Necessary for College? what is the source to earn money by typing please tell me…..
i am aving trouble in buying this software. can any one help…?